Forn Dodonna was an admiral in the Republic Navy during the Jedi Civil War. She was one of the most senior of naval personnel during the War. 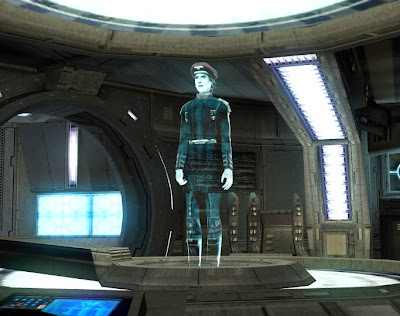 Towards the end of the war, Dodonna was signaled by Carth Onasi, who informed her of the Star Forge, a massive factory-space station that was being used by the Sith. Dodanna herself led the assault on the Star Forge, with the help of Jedi Master Vandar Tokare. Helped by the battle meditation of Padawan Bastila Shan, Dodonna broke through the Sith blockade of the Star Forge and ordered her ships to destroy the space station’s main stabilizer. She later awarded the crew of the Ebon Hawk, including Carth, for their help during the battle. As an admiral serving with the Republic Navy, Admiral Dodonna led Republic forces against the Sith Empire during the Jedi Civil War from her flagship. Towards the end of the war, Admiral Dodonna was contacted by another naval officer, Carth Onasi, informing her of the location of a massive orbital factory called the Star Forge, an ancient relic of the Infinite Empire. The Star Forge was being used to churn out all the starships and war droids that powered the Sith fleet. Dodonna realized that this was the opportunity she desperately needed to put an end to the war. Gathering a fleet together, Admiral Dodonna set out for the Star Forge system. En route, Admiral Dodonna’s fleet was reunited with many survivors of the Sith attack on the Jedi Enclave on Dantooine. Led by Jedi Master Vandar Tokare, the group joined the fleet in its endeavor to destroy the Star Forge. Upon arriving in the system, Admiral Dodonna’s fleet was confronted with a sizeable defense fleet, which guarded the Star Forge itself. Dodonna was contacted by Carth Onasi once more, from the Ebon Hawk, whose crew deactivated a massive interdictor field being generated from the nearby planet Lehon, which would have otherwise destroyed the fleet. Admiral Dodonna was suffering heavy losses in space and suggested a retreat, but Carth insisted that the Republic probably wouldn’t get another chance to strike at the Star Forge again. Dodonna conceded, and the Ebon Hawk’s crew, at the advice of Master Vandar, resolved to lead a Jedi strike team onto the Star Forge, to find and kill Darth Malak, the leader of the Sith Empire. 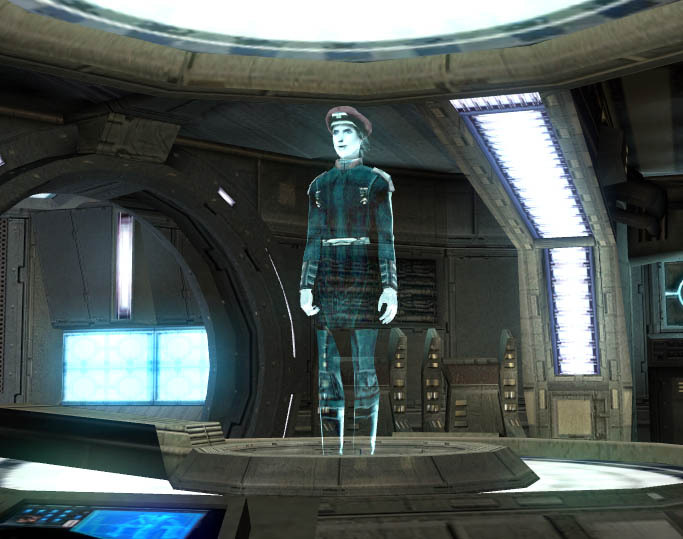 Admiral Dodonna as a hologram, communicating with the Ebon Hawk. Meanwhile, Dodonna was facing troubles of her own. Her entire fleet was faced with an impenetrable defensive line, preventing her from ordering a bombardment of the Star Forge. Carth attributed this to Bastila Shan, a fallen Jedi who was very adept at using battle meditation, a Force ability that allowed her to inspire allied troops and demoralize enemies, influencing an entire battle. Bastila’s battle meditation was allowing the Sith to quickly counter every strategy Admiral Dodonna devised. Nevertheless, Admiral Dodonna pressed on. Conditions soon changed after Bastila stopped using her battle meditation against the Republic fleet. Soon Dodonna’s relentless press against the Sith ranks finally punctured a breach in the fleet’s formation, splitting it into two groups. Admiral Dodonna quickly exploited this development, sending Red Squadron in with Green Squadron to widen the gap. She then ordered her capital ships to reinforce their positions. Once in range, Admiral Dodonna’s fleet commenced a concentrated assault on the Star Forge. Realizing that the Star Forge was too well reinforced to be destroyed directly by the fleet, Dodonna proposed a precision strike against the Star Forge’s main orbital stabilizers. With these out of commission, the Star Forge would fall out of orbit and crash into the star below. This strategy was quickly implemented. After Admiral Dodonna’s capital ships destroyed the stabilizers, she ordered the fleet to pull back away from the Star Forge, unwilling to risk any of her ships being destroyed during the Star Forge’s descent. Dodonna’s fleet moves to attack the Star Forge directly. The Star Forge was finished, colliding with a solar flare which caused the Star Forge to incinerate from within. With the Star Forge destroyed and Malak dead, the Sith fleet was thrown into disarray, allowing the Republic to sweep through Sith space and recover their losses. Returning to Lehon, the fleet celebrated their victory. Dodonna herself awarded the crew of the Ebon Hawk with the Cross of Glory, the Republic’s most prestigious medal, on the steps of the Temple of the Ancients (the very place that the crew had disabled the disruptor field generator at), thus commemorating them for their invaluable support during the battle; even the crew’s droids were given medals. The remainder of the war was short; the Dark Jedi and Sith Lords on the Sith homeworld of Korriban quickly tore each other apart as each attempted to seize the title of Dark Lord of the Sith, a title held by Malak until his death, in a quick yet brutal civil war. This was the final blow to the Sith war effort, and the Jedi Civil War was over, though the Republic still had to recover from the destruction caused by the war. It can be speculated that Dodonna had Carth promoted to admiral during this time. Admiral Onasi would play an important role during the Dark Wars. Admiral Dodonna was a very strong-willed woman. After all, she was one of the few female fleet commanders in recorded history. Despite her gender, she was respected by her officers, and they served with her faithfully. Dodonna was a very compassionate person, and cared for her entire fleet, showing concern for it and considering a retreat several times during the Battle of the Star Forge. Dodonna was also appreciative of those who helped her, and she was modest enough to accept help when offered. Dodonna awarded the crew of the Ebon Hawk with the Cross of Glory, and gave them credit for the battle’s outcome, not keeping any of the glory for herself. But compassion does not gain rank, and Admiral Dodonna’s military traits are what afforded her the considerably high rank she possessed. Admiral Dodonna was an extremely consummate military commander, overseeing every step of an operation, employing a variety of substrategies to achieve victory. This multi-tasking, micro-managing could prove a distraction, however, and Dodonna could lose sight of a key enemy maneuver during the heat of battle. Nevertheless, this trait was very crucial during the Battle of the Star Forge, when each fighter counted against Bastila’s battle meditation. From the smallest fighter to the largest capital ship, Admiral Dodonna perceived them all equally important, and used them to the best of their abilities. When she saw an opportunity, she wasted no time in seizing it. During the Battle of the Star Forge, Dodonna was able to skillfully take a small breach that had formed in the enemy’s formation and enlarge it, pushing her capital ships right in behind her fighter squadrons, effectively wedging her formations and cleaving the Sith ranks in two, allowing her to bombard the Star Forge itself. Dodonna, as a military officer, was a perfectionist. She was neatly groomed, her hair cleanly trimmed, and her uniform spotless. Dodonna also had exceptional posture, notable especially due to her tall, lean build. Dodonna also had light brown hair and gray eyes. This article uses material from the “Forn Dodonna” article on the Star Wars wiki at Wikia and is licensed under the Creative Commons Attribution-Share Alike License. What does Alganon and SWTOR have in common ?